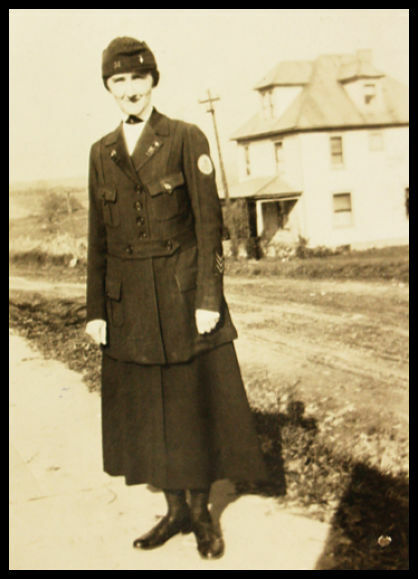 Nurse Harriet J. Eckels was born on April 2, 1888 in New Wilmington, Pennsylvania. She and 100 fellow Red Cross nurses and 30 physicians organized a hospital unit out of Youngstown, Ohio, and mustered into the Army to serve in World War I. The unit left for New York on September 11, 1917 where they trained at Ellis Island for three months before sailing for Contrexeville, France and Base Hospital 31. They arrived on New Year’s Day 1918 and remained there until April 1919 treating the wounded. After the battle of Chateau Thierry (France) on July 18, 1919 the hospital received some 634 patients. Returning back to the states, Miss Eckels continued her nursing career. She was elected as the school nurse for Youngstown public schools in October 1919 where she served for a number of years and later at Westminster’s infirmary. Harriet died at her home in New Wilmington on May 4, 1984. The hospital unit’s Chaplain was William Carson Press who graduated from Westminster. Other nurses from Lawrence County who served during the war included Mary McClenahan, Olive Reed, Frances Currie, Liza Dean, Katherine Edwards (first to enlist), Elizabeth Lewis, Mrs. W. W. Clendenin, Jennie Perry, Mary Bartel and Mary Charles.